This is the second in a series of articles investigating ruptures in a carefully fostered pro-corporate united front among First Nations Peoples. The series focuses on the wider implications of recent statements by pro-mining Aboriginal activist Marcia Langton. The tide has certainly shifted. The actions and voices of grassroots First Nations Peoples are gaining momentum. A Change.org petition, “As an Aboriginal Person, Jacinta and Bess Price DO NOT represent or speak on my behalf” had gained nearly 7,500 signatures by February this year. Both have been prominent media figures. Bess Nungarrayi Price is Jacinta’s mother, a pro-Intervention activist and former NT parliamentarian. Langton points out that unlike her mother, Jacinta Price lacks a base among First Nations. 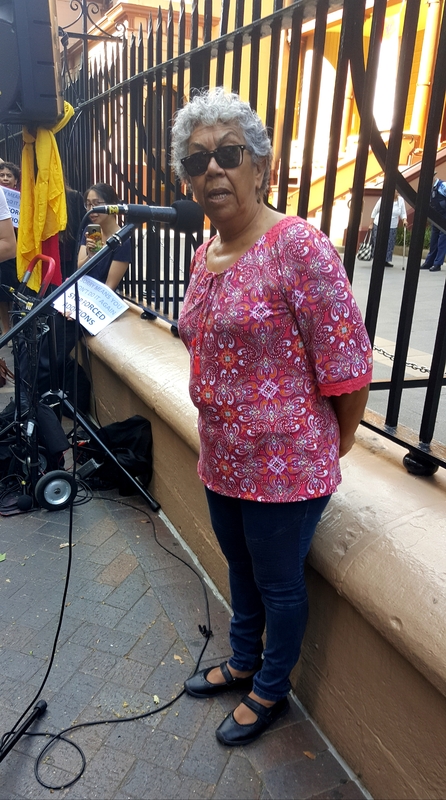 Kayteteye & Arrente woman Christine Kngwarraye Palmer speaking in Sydneyon the 11th anniversary of the NT Intervention in June, She is a member of Grandmothers Against Removals, Alice Springs, and The Strong Grandmothers of Central Desert Region. Marcia Langton noted the growing opposition to the Prices in her exposure of them in August. Now Langton appears to be listening more carefully to so-called ‘small groups’ and people she’d once dismissed, like anti-Intervention activist and Tangentyere Council member Barbara Shaw, from Mount Nancy Town Camp in Alice Springs. The Business Council of Australia (BCA) is integral to the Cape York policies Langton praised. In Canberra recently as part of the Tangentyere Council’s Women’s Family Safety Group, Barbara Shaw said, "We're just a small group of women who wanna work on prevention to keep our communities safe, to keep our children safe and out of harm's way, to support our men who are also going through hardship and hard times." Then there’s another small group, Grandmothers against Removals (GMAR). Its members began their fight in Gunnedah in northern NSW six years ago in response to the ‘Friday Special’, the Department of Community Services van that regularly removed kids from school on Friday arvos, so parents or carers had to wait till the following Monday to Gomerget assistance. Persistence saw GMAR spearhead a continent-wide movement. The Gunnedah grandmothers highlighted the continuing stolen generations. They eventually regained their own grandchildren, but the nationwide theft of children is systematic and growing. NSW Indigenous academic Larissa Behrendt, who Langton once said should “get off her high heels” and come to NT communities, is a leading figure in the struggle. Her documentary, ‘After the Apology’ opened this year’s Adelaide Film Festival to a standing ovation. Langton’s views have always been more nuanced than Price’s, but in 2016 she focused on individual Aboriginal stories and individual Aboriginal responsibility. She wrote of “the most taboo of topics in the Aboriginal world: sexual assault of children, alcohol and drug fuelled violence that destroys families, and failed parents” as the cause of child removals. 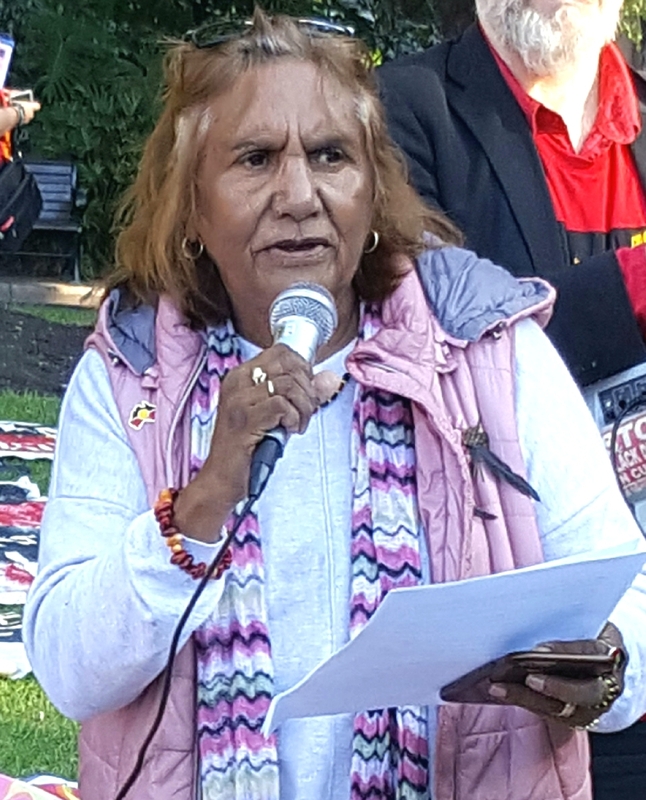 Gomeroi woman Debra Swan, of Grandmothers Against Removals, outside NSW Parliament House in November protesting a new law enshrining theft of children. But who gives Jacinta Price or her mother airplay? Langton mentions ‘mainstream television’ and targets Mark Latham’s pro-Australia Day promotion of Jacinta (when he was still with Sky and before he became a One Nation candidate). Jacinta Price also gets ABC coverage, particularly on The Drum. But the Murdoch media is her major mouthpiece. Every comment chosen used strong language sure to shock and offend his readers. Some of the seven chosen comments (from tens of thousands by Aboriginal Peoples condemning Price’s stand over many years) were sexually violent and threatening. Some were clearly metaphorical. Bolt named each person whose comments he’d shared, listed the area where they lived, often their photos and where they worked. He also demanded some lose government funded work. This echoed a similar call six months earlier by Warren Mundine. Bolt finished with an attack on the women’s movement, Clementine Ford and ‘the Left’ (of whom all would have abhorred threatening comments, while understanding the deep sense of betrayal from which they emanated). Bolt finished with a plug for Jacinta’s bid for the federal seat of Lingiari. In Alice Springs, her home, it’s rumoured that Twiggy Forrest has funded her campaign to the tune of $900,000. Langton makes clear the comments had been enraging far right twitter and Facebook feeds and encouraging widespread trolling of First Nations’ ones, before Bolt gathered them into one place. Langton’s article was published 12 days after Bolt’s, another clear impetus for her article. Six months earlier Langton also spoke out powerfully against Warren Mundine after he labelled Dtarneen Onus Williams a ‘hypocrite’ and a ‘hater’ for a powerful metaphorical Invasion Day speech. He called for the defunding of the Koorie Youth Council for whom Onus-Williams volunteers. “The serious question here is why is the government funding these groups and these organisations when the people involved are haters who have no scruples about taking taxpayers’ money and then spitting in their faces,” Mr Mundine said. Former Victorian premier Jeff Kennett was mild by comparison, while Langton was given a single paragraph to Mundine’s five. Who gave Warren Mundine voice? News Corp’s ‘The Australian’. It calls Mundine an ‘Indigenous leader’. Just which Indigenous Peoples follow his lead isn’t too clear. Murdoch’s Sky awarded him his own TV program anyway. To use a saying from last century, Blind Freddy can see how powerful the Murdoch empire is, despite its limitations. News Limited is the Business Council and Australia’s biggest media player. The Herald Sun, Daily Telegraph and co amplify the alt-right voices in support of Jacinta. Each copy is shared numerous times in cafes, gyms and waiting rooms. Then there’s the blogs, the podcasts, the twitter and Facebook feeds, the promotion by likeminded shock jocks, plus Sky, Foxtel etc etc etc. No single platform is huge, but together they add up. There’s nothing ‘mainstream’ about it. Nor does it toe the BCA line. Langton has been loath to point her finger at corporations supporting Jacinta Price. ‘Barking mad racists’ and ‘mainstream media’, yes. But not corporations. Not even Murdoch’s. In fact, she mentions a single piece in The Australian, which is at odds with the overall avalanche of Murdoch coverage. It questions Jacinta Price’s behaviour. Clinging to a corporate future? Now grassroots Aboriginal Peoples are uniting. Marcia Langton has amplified some of their concerns using her prominent media profile. The BCA has invested enormous efforts to win over Aboriginal leaders and groups to a corporate future. Unlike the Murdoch fiefdom, the BCA doesn’t want a far-right takeover… well not yet anyway. It still supports the ability of the tattered parliamentary circus to hoodwink people, without Tony Abbott at the helm. Whether Marcia Langton still clings to the Business Council model remains to be seen. Reality is a powerful teacher. Perhaps the failure of the corporate model to provide basic improvements to the lives of the vast majority of First Nations Peoples is raising questions for her. Many people hope so. She would be a powerful advocate if she consistently looks to grassroots Peoples rather than corporations for guidance.